The graph below shows the absorption rate for homes (see the month supply on the right side). Clearly anything with a less that 5 month supply is a sellers market but homes currently over 700,000 are in a firm buyers market. More info about the chart above is at the bottom of this story. A total of 6406 contracts have closed in the last 6 months with a median sold price of $165,000. 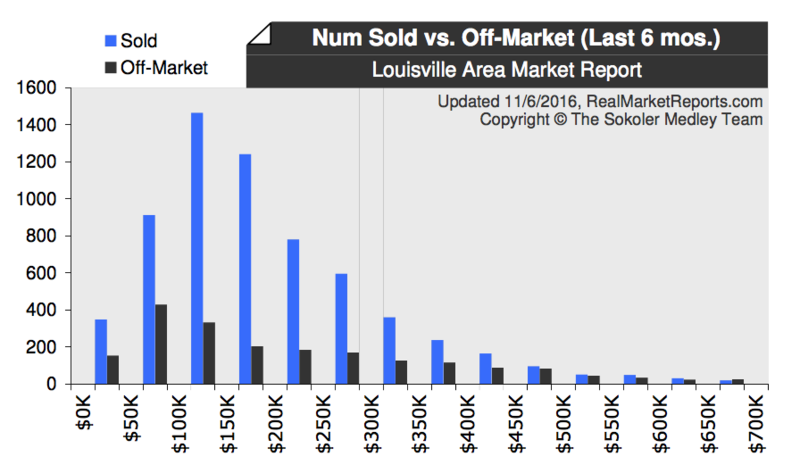 Breaking it down, we notice that the $100K - $150K price range contains the highest number of sold listings. Alternatively, a total of 2105 listings have failed to sell in that same period of time. Listings may fail to sell for many reasons such as being priced too high, having been inadequately marketed, the property was in poor condition, or perhaps the owner had second thoughts about selling at this particular time. Analysis of sold properties for the last six months reveals a median sold price of $165,000 and 16 days on market. Notice that properties in the $150K - $200K price range have sold quickest over the last six months. The recent history of sales can be seen in the two charts below. 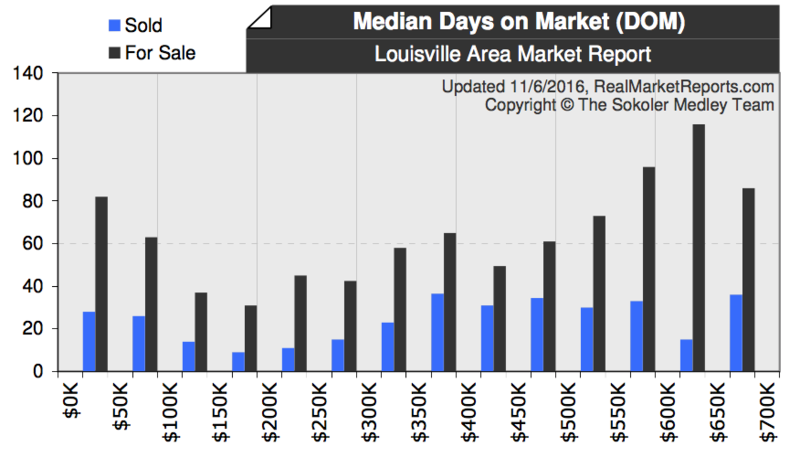 The median sold price for the last 30 days was $163,000 with a DOM of 21 days. a.Number Active: The number of listings for sale which are currently being marketed but do not yet have a purchase agreement. ? b.Days on Market (DOM): The marketing period of currently active listings. This does not account for some listings which have had a previous listing period, but were re-entered as a new listing. ? c. Current List Price: The price that a property seller is currently asking. ? a.Number Pending: The number of current listings for which a contract has been signed but has not yet closed. ? b.Pending Ratio: Sometimes called a “list-to-pending ratio”. This is a measure of how fast properties are going under ?contract vs. how fast they are being listed. ?Pending Ratio = P (Number of Pending Listings) A+P (Number of Active + Pending) ? (P) represents properties that buyers have chosen? (A+P) represents the entire pool from which they have chosen ? a. Number Off-Market: The number of listing agreements that have failed to close in the last 6 months. Some owners may choose to re-offer their property for sale. a.Number Sold: The number of properties that have gone to a closing in the last 6 months. ? 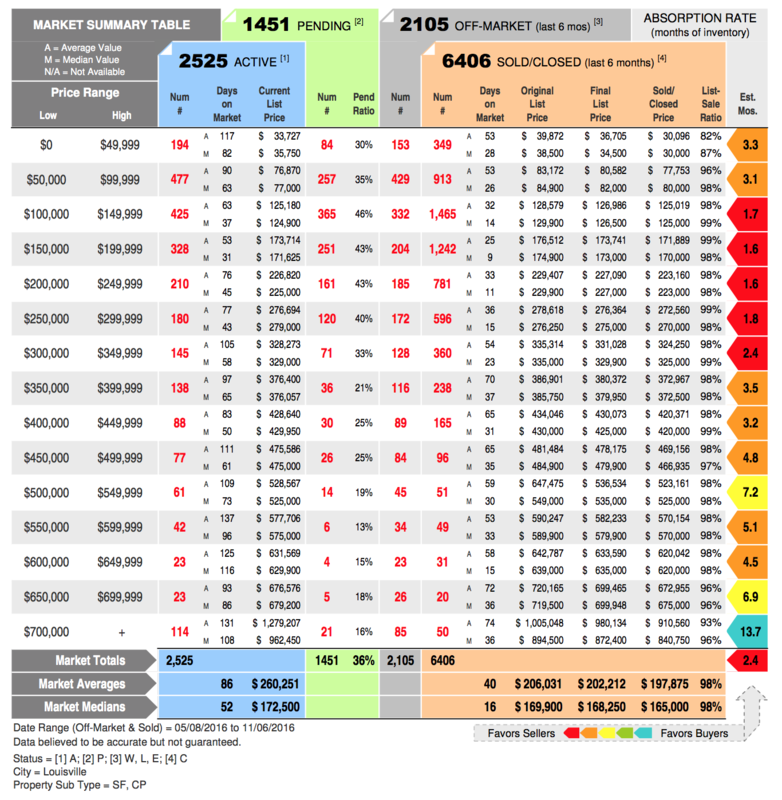 b.Days on Market (DOM): The marketing time it has taken properties to sell in the last 6 months. ? c. Original List Price: The price at which a sold property was originally marketed. ? d.Final List Price: The price at which a sold property was marketed just prior to selling. ? e.Sold/Closed Price: The price for which a property sold. ? List to Sales Ratio: The percentage of the list price that the buyer ultimately paid for the property. List to Sales Ratio = Sold Price ?Final List Price ? a. Absorption Rate / Months of Inventory: An estimate of how fast listings are currently selling measured in months. For example, if 100 properties sell per month and there are 800 properties for sale - there is an 8 month supply of inventory before counting the additional properties that will come on the market.